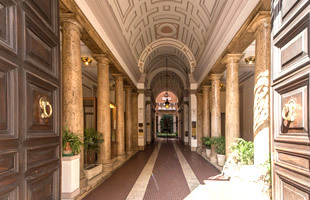 The Matisse B&B Rome offers the perfect blend between classical luxury in an elegant style and great value for money. Located on Via Nazionale between the famous squares of Piazza Repubblica and Piazza Venezia, the Matisse B&B Rome is within walking distance of the Coliseum, the Imperial Roman Forum, the Trevi Fountain, Termini Station and the Opera House. Occupying a gorgeous 19th century Italian palazzo, the Matisse B&B offers 7 stylish rooms in a variety of sizes including twins, doubles, triples and even quadruples. Perfect for families and groups on a budget, the Matisse B&B also offers an internal courtyard in which to soak up the Roman atmosphere and a characteristic lounge area which also provides an iMac computer for guests use. 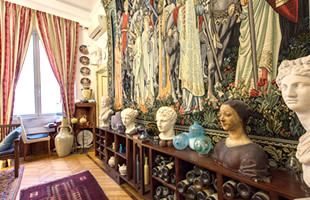 The Matisse B&B Rome not only offers comfortable facilities, but also provides a host of friendly and professional services. Despite its small size, the Matisse B&B is proud to offer services comparable to a much larger hotel, and our highly trained multi-lingual staff are both attentive and welcoming. Our reception staff are on hand to offer an express check in and check out service with check in operating from 2pm and check out being until 10 am. Our reception staff would also be pleased to assist with any tourism related questions and can offer advice about restaurants, shows and guided tours. Visit our Photo Gallery page to see for yourself how splendid our rooms are and what great value for money they represent. We understand the needs of the 21st Century guest, and so in addition to free Wi-Fi internet access throughout the accommodation, we also provide an iMac computer with wired internet access in our reception lounge. Our reception staff even offer a currency exchange service in addition to the more traditional luggage storage service, and on request can also arrange a shuttle service to the airport or other destinations (surcharge applies). Indeed, one of the best areas for restaurants, the Monti area, is on our doorstep and guests can also find a host of chic boutiques to browse as well. So what are you waiting for? Make your booking today and enjoy the lowest possible prices through our Official Booking System! For the families amongst you, we understand that sometimes the parents need a break too, and so we can offer a professional child care service as part of our dedication to our customers. No matter your needs, we are keen to look after our guests and pride ourselves on our reputation of offering a superior level of service to our guests. Perhaps this is why we have also been recommended by the New York Times and enjoy a high rating on booking.com and Trip Advisor. Your feedback is always welcome and we aim to constantly improve our service to our guests.